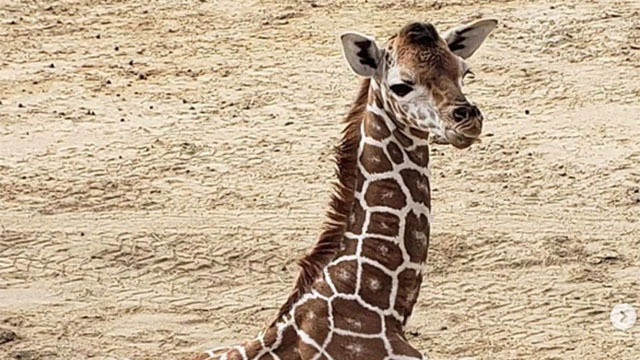 San Diego Zoo Safari Park veterinarians and animal care staff are providing a recently born giraffe with specialized care due to nasal and throat inflammation, the zoo announced Friday. The zoo’s animal care staff noticed the calf, born Jan. 27, having difficulty nursing from its mother while the two were in the Safari Park’s field exhibit earlier this week. They subsequently moved the calf to the zoo’s Paul Harter Veterinary Medical Center for an exam and CT scan. According to Howard, the calf is in stable condition and recovered well from the anesthetic used to perform the exam. Zoo officials have decided to bottle-feed the calf to avoid further nursing issues brought on by the inflammation. Animal care staff have also taken to rubbing an animal print blanket on the calf’s mother and wrapping him in it to calm him during feedings. “When the calf smells his mother’s scent, it stimulates him — and he is more likely to take the bottle from us,” said Safari Park Senior Keeper Eileen Neff. The zoo’s animal care staff plans to reintroduce the calf to the giraffe herd once the inflammation recedes.